With Cinco de Mayo right around the corner, many Americans will be celebrating Mexican heritage with tacos, tamales, and tequila. In preparation of this Mexican American holiday, CHD Expert, the Chicago-based foodservice database and analytics firm, reports on the US Mexican restaurant industry and finds that Mexican food is truly a dietary staple, heavily consumed by Americans all year round. The Mexican Menu Type is among the top three most prevalent menu types in the USA, behind Varied Menu and Pizzerias respectively. According to CHD Expert, consumers spend more than $39 Billion at Mexican restaurants each year. Of that revenue, Mexican restaurants spend approximately 34 percent or $13 Billion on purchasing food, beverages and other disposable products. CHD Expert indicates that the average Mexican restaurant brings in revenue of over $700,000 each year. For a snap shot of the US Mexican market potential breakdown, see Figure 1. Of the approximately 54,000 Mexican Restaurants in operation, roughly 56 percent are considered Full Service Restaurants (FSRs), and 44 percent are considered Limited Service Restaurants (LSRs). By definition FSRs operate with a wait staff and offer table service, while LSRs require food to be purchased at a counter and paid for before food is served. Within the FSR market segment, 87 percent of the restaurants fall within the ‘Casual Dining’ category. An example of this type of restaurant would be Acapulco or El Torito. Within LSR, 56 percent of the restaurants are considered Quick Service, with Taco Bell leading the way in total number of establishments in this category. Fast Casual follows with 42 percent of the LSR market share, with restaurants like Chipotle. Another interesting fact about the Mexican Restaurant Industry is that it is dominated by independent restaurants; approximately 74 percent of the nation’s Mexican restaurants are independent. Contrarily, 26 percent of Mexican restaurants fall into the chain category. CHD Expert defines a chain as having 10 or more units in operation, while an independent restaurant will have less than 9. There are more than 14,000 Mexican Chain restaurants in the US. Taco Bell, with more than 40 percent of the chain market, holds the largest share. They are followed by Chipotle Mexican Grill, which has expanded both nationally and internationally, and now makes up over 10 percent of the Mexican Chain Restaurant category in the US. Rounding out the top five most prevalent Mexican Chain restaurants in the USA are Qdoba Mexican Grill, Del Taco, and Moe’s Southwest Grill, respectively. Breaking down the data further, CHD Expert takes a look at how the Mexican restaurant landscape compares from state to state. It’s no surprise that the states of California and Texas dominate in terms of total number of Mexican restaurants, with over 36 percent of the nation’s total Mexican Restaurants residing within those two states. Florida, while more commonly known for its Cuban/Latin cuisine, also has its fair share of Mexican Restaurants, coming in at number three amongst the 50 states. Rounding out the top five are two northern states, New York followed by Illinois, with their popular ‘foodie’ scenes and large Mexican expat populations. Overall, Mexican food continues to conquer the southwest, and continues to make gains on both coasts, thanks in part to not only its deliciousness, but also its convenience, flair, and budget-friendly prices. Considering Mexican restaurants by region, the southwestern states in general have a much higher percentage of Mexican restaurants in their overall restaurant landscape compared to other regions of the US. And while Mexican restaurants have yet to assert dominance in the northeast, the region with the smallest percentage of Mexican restaurants in the nation, there are still thousands of Mexican restaurants in the region. See figure 3. 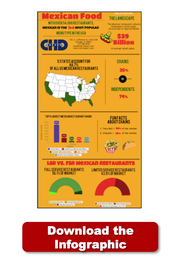 In terms of average check, 33 percent of restaurants in the CHD FIND database have a range of $10 to $15 dollars, representing the vast majority of Mexican restaurants across the states. However, 24 percent of Mexican Restaurants have an average check range is $5 to $7 dollars, indicating that Mexican restaurants also offer more affordable, grab-and-go options. “Americans love Mexican food, and this popular cuisine type appeals to palates all across the nation”, said Brad T. Bloom, Director of Sales at CHD Expert North America. “This is particularly relevant for food distributors and food manufacturers who sell direct to operators, as our CHD FIND™ Market Potential tool indicates that Mexican restaurants require fresh ingredients and proteins, and they are now regularly opening up in geographies where 10 years ago they were far and few between. This is another example of how the restaurant market landscape is ever evolving, and at CHD Expert we take pride on keeping track of all restaurant market landscapes.” For those who would like more information about the US Mexican Restaurant Industry, CHD Expert has created this complementary visual representation of the Mexican Restaurant Industry landscape.